The PADI Open Water Diver Course is the very first step in scuba diving education, are you ready to discover the wonders of the underwater world with us on MV Giamani? Upon completion of your course with MV Giamani, you will be issued a PADI certification which is recognized worldwide. 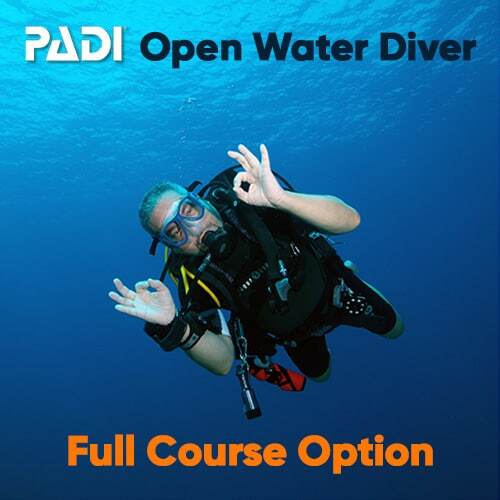 The Open Water Diver Course consists of three main sections: Knowledge Development (theory), Confined Water Training (pool) and Open Water Training (sea). At the end of the course, you will be certified to dive independently (with a buddy) up to a maximum depth of 18 meters. This portion of the course aims to develop your understanding of the basic procedures and principles of scuba diving. The learning goal is achieved through three steps. The first is reading your Open Water Diver Manual. The concepts learned during the reading are then expanded by watching the Open Water Video. Finally, all these facts are summarized and covered again by your Instructor. These classroom sessions with the instructor are the perfect time to ask and clarify any doubt that you may have. This practical portion of the course takes place in the swimming pool and allows you to practice and master the basic Scuba Diving skills that you learned during your Knowledge Development, under the close supervision and guidance of the instructor. The Confined Water Training is divided in 5 distinct sessions which can be either split between days or performed in a row. You’ll learn everything from how to set up your equipment to clearing your mask of water without surfacing, regulator recovery, buoyancy and finning techniques and all the other safety skills. This is great fun and will prepare you to fully enjoy your cruise on MV Giamani! This is where the real fun begins! After all the practice in the confined water, it is now time to practice all those skills in the “real world”, the sea. The PADI Open Water Diver Course standards require a minimum of 4 training dives in open water, but with an MV Giamani liveaboard cruise, you will be able to do a lot more! This is why combining your course with a liveaboard is a great opportunity to become a great diver right from the start, as our professional and friendly MV Giamani instructors will assist you and guide you throughout the whole cruise duration and not just the course itself. With MV Giamani you can choose between three different ways to do your PADI Open Water Diver Course. The “standard” solution is the Full Course Option, in this case you will perform all Knowledge Development, Confined Water and Open Water sessions in our facilities here in Phuket. With the eLearning Option instead you will have the chance to cover all the Knowledge Development portion in advance online, from the comfort of your home. With the Course Referral Option you will go through all the Knowledge Development and Confined Water training with your local dive center/instructor, while you will only join MV Giamani for the remaining Open Water training dives. With the PADI eLearning Course Option, you will be able to complete the whole Knowledge Review portion of the course online from the comfort of your home before you even come to Thailand! This will allow you to save precious time during your holiday, as you will not have to go through all the theory teachings while here. 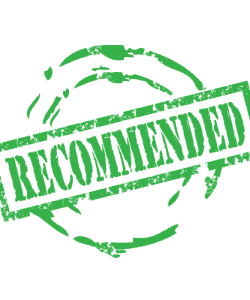 At the start of the course you will just have to review your knowledge with the instructor, clarify eventual doubts, and then move straight to the swimming pool for the confined water training. Depending on the MV Giamani’s schedule/destination of your selected cruise/season, on Day 1 (afternoon) you might have to do also two beach dives before the start of the MV Giamani cruise, as some of the National Marine Park’s rules do not allow to perform OWD course training dives #1 and #2 within the national park. This will be on the Later on the same afternoon you will board MV Giamani to complete your Open Water training and enjoy an unforgettable liveaboard cruise. *for more details about diving destinations & dates please check the full schedules HERE..
PRICE: 13,200 THB for 1 person → BOOK NOW! TOTAL DURATION: 5 days Available from 15 October to 15 May only! *for more details about diving destinations & dates please check the full schedules HERE. PRICE: 18,900 THB for 1 person → BOOK NOW! (private instructor dedicated to you for the whole trip). The minimum age required for scuba diving is 10. Divers between 10 and 14 yrs of age can earn the Junior OWD certification, and must always dive under the supervision of an instructor. From 10 to 12 yrs old the maximum depth alowed is 12 meters, while from 13 yrs it’s 18 meters. Of course, an important requirement to be able practice scuba diving is having at least basic swimming skills. By PADI standards you must be able to swim for at least 200 meters without any help or equipment, OR at least 300m with mask, snorkel & fins. Another requirement is to be able to float or thread water for at least 10 minutes without help or support from any floating device. Before stating the course you will be requested to fill a Scuba Diving Medical Questionnaire with a list of medical conditions that may not be compatible with diving. Having any of such conditions doesn’t mean that you will not be able to dive, but you will have to seek specific advice from a doctor before starting any scuba diving activity. With the PADI Open Water Diver FULL COURSE Option you will cover all the training portions of the course here in Thailand with us. The Knowledge Development (theory), and Confined Water (pool) training sessions will take place at our top class facilities in Phuket (2 full days), before starting the liveaboard cruise onboard MV Giamani (2 or 4 days depending on your selected cruise option). PRICE: 21,700 THB for 1 person → BOOK NOW! TOTAL DURATION: 6 days Available from 15 October to 15 May only! PRICE: 27,400 THB for 1 person → BOOK NOW! (instructor dedicated only to you for the whole trip). 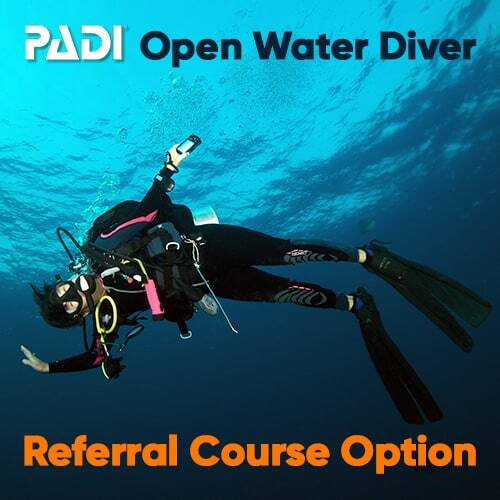 The Course Referral Option gives you the opportunity to cover all the Knowledge Development and Confined Water Training portions of the course in your own town/country with your local dive center/instructor, and then move to MV Giamani in Thailand to complete the remaining training dives in Open Water. Depending on the MV Giamani’s schedule/destination of your selected cruise/season, on Day 1 you may have to do two beach dives before the start of the MV Giamani cruise (some National Marine Park’s rules do not allow to perform OWD course training dives #1 and #2 within the national park). This is great for those who have a trusted dive instructor/center near home but the location doesn’t offer optimal conditions for scuba diving in the sea (e.g. too cold), as here in Thailand we have perfect conditions all year round and an incredible amount of beautiful marine life. (to pay to the dive center/instructor where you start your course. 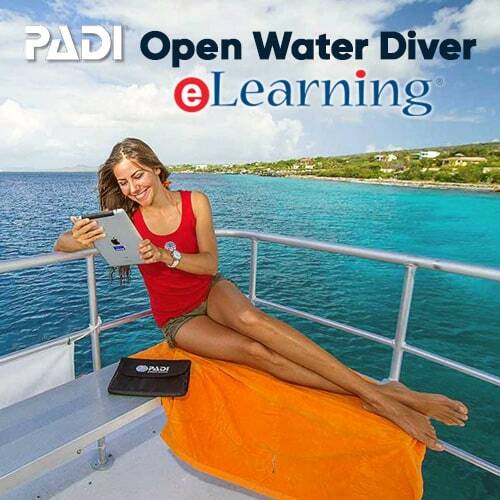 Below you will find all the prices for the PADI Open Water Diver course options we offer. The course price per person varies depending on how many people you are. All the courses we offer are with PRIVATE instructor, so you will not have to share the instructor with a stranger or a big group. However, if you are a family or a group who wishes to do the course together, you will share the cost of the instructor and the price per person will decrease as described below.